The flag itself looks better no doubt, but I'm less optimistic about that stripe being better than the old cross - it doesn't tell you so clearly something is not okay with your flag as the X does. Yeah, I was thinking of making a version with an X instead if an "! ", but for some reason it occurred to me too late. I'll make one as soon as I can and post it here (not feeling well currently). Maybe if you make it more visible it would actually work, because right now i didn't even notice it was a "!" :d I think you would need to sacriface the flag visibility, but I think it misses the point. I'm waiting for the cross version! Personally, I like v6 better since it makes the outline easier to see. I really liked v6 so I messed around with it a bit. I removed the pixed with the red X, it turned out good imo. I also thought the gray background was a bit too light, especially on the blue flag it's hard to destinguish between the blue and the dark background. Looks good. I'd avoid making X any lighter because it might blend in with the flag too much, but your version looks fine to me. On a sidenote, I think blue team's color needs to be addressed. It's clearly less visible than red and needs to be changed to #105ADB or something very similar. No problem, thanks for improving it too. There's still the default interface though. 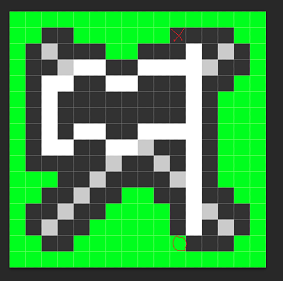 I want to work on it when I get the chance, though that won't be for 1.6.9. 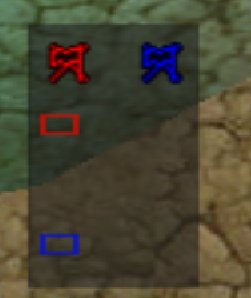 - smalldot.bmp and deaddot.bmp - improved vertical alignment so it's more centered in the scoreboard. - noflag.bmp - included the latest version by homerofgods from this post. - renamed folders to use all-lowercase letters. Also I need your feedback. 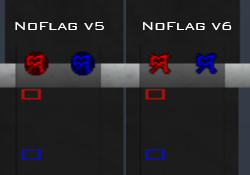 Here are two different flag icons - one with the gap near the flagpole, another without the gap. Tell me which one you like better. Without the gap is better. - dot.bmp - reverted ping dot back to "classic" version - a simple circle only with some minor cleanup. - flag.bmp - removed the gap between flag and flagpole.